As some of you may remember, I was sued for libel by Peter Reynolds, President (“irrevocable until death”) of CLEAR-Cannabis Law Reform, for posting a variety of things that he didn’t like on my blog, the long story of which you can read here. I defended myself as a litigant-in-person and me and Peter Reynolds battled our way across reams of paper and multiple trips to Court until eventually it turned out that he didn’t care anywhere near as much as I did about him being a homophobic racist (probably should have seen that one coming) and just wanted me to take down the one article that I had no principled attachment to. So, we signed a settlement agreement in which I took down the article, Peter Reynolds withdrew his lawsuit and gave up any right to sue me for calling him a homophobic racist on the internet or to claim costs against me, and we both signed a gagging order for a year. That ran out in 2015. Was one article worth the estimated £2500 Peter Reynolds spent on suing me? A question only he can answer, I guess. I never meant to fall into the campaign to legalise cannabis, I was happily working away on drug law reform when Peter Reynolds burst into my life and called me a “genetically confused half-werewolf half-woman” and the community rallied behind me (for which I remain grateful, thankyou). So after Peter Reynolds finally backed away from the cliff of his own making, although I met some good people in the cannabis movement, it wasn’t really my world, and I moved on to other things. I am a qualified mental health occupational therapist, I have a full-time job, I do stuff that is fulfilling, and interesting and cool. Peter Reynolds and that time he sued a 23 year old Theology graduate for allegedly libelling him has been nought but a killer dinner party story for years now. Many, many people have been entertained. However, I was not the only person who got sued. In 2013, Peter Reynolds sued me, Chris Bovey, Alun Buffry and Greg De Hoedt, for which he had admitted that he had paid £1600 each to file writs against us. Alun settled, at no cost to him and now that his gagging order has run out, with no consequences for his speech. I settled, at no cost to me, and now that my gagging order has run out, with no consequences for my speech. 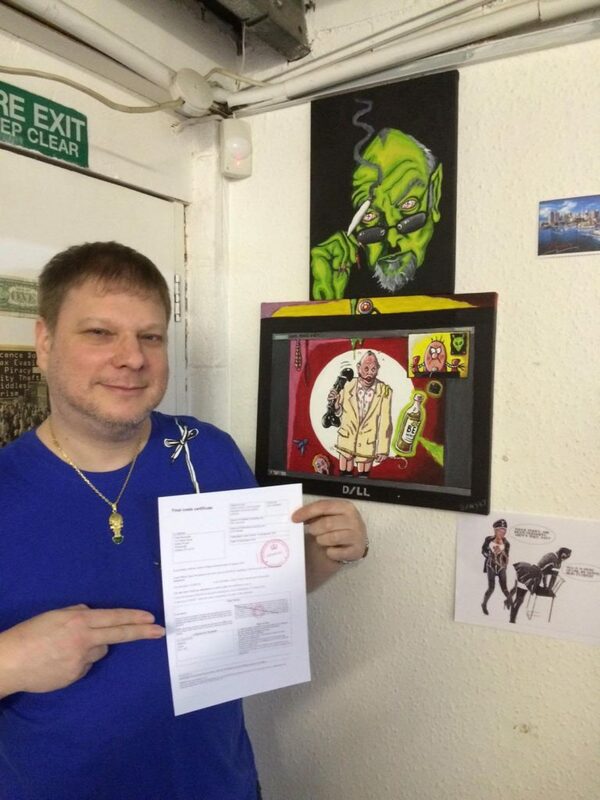 Greg did not respond to the lawsuit and paid £5,000 in court fees and other costs. Sadly “my oldest friend is a jet black Jamaican” entered our vocabulary just a little too early to take full advantage of the meme era. Because you have to state exactly who saw the publication and in whose eyes your reputation has been lowered, Peter Reynolds also alleged that all 23 million UK users of Facebook should be considered to have seen the offending words and images that Chris had posted to his private Facebook feed. Chris certainly has friends, but he doesn’t have 23 million of them. That is… a big number. That’s where the public accounting of this story ended, because suddenly Peter Reynolds, so enthusiastic a communicator that at one point I had to require him to contact me only via a third party to whom I had granted power of attorney to interact with him on my behalf to stop the tide of threats and whinging appearing in my inbox at all hours of the day, mysteriously vanished, despite continuing to tweet dozens of times a day. Faced with a £20k+ legal bill, he floated away on the ether, moving house, refusing to notify Chris’ lawyers as to where he had gone, and generally pretending that he hadn’t actually spent hundreds of hours of his time and ours claiming that he was going to win the greatest legal victory since Magna Carta. It has a been a frustrating few years for Chris, trying to track down the most important man to hit the cannabis movement since the inventor of the bong, who mysteriously never attends public cannabis events, conferences, nor seemingly has any relationship with anyone at all in the movement. He somehow managed to lose another entire Exec back in 2016 as well – even Derek joined them that time (Derek’s meltdown in the comments of my post on Peter Reynolds impersonating a fictional journalist, btw, is still something I read every six months or so, and I highly recommend if you want to be tickled). Unfortunately for Peter Reynolds, his parents were real people, and in 2016 his mother passed away, leaving a will that we found in a public registry. A will which left him one fifth of a six figure sum, minus the money he had borrowed from his parents, presumably to pay court fees. 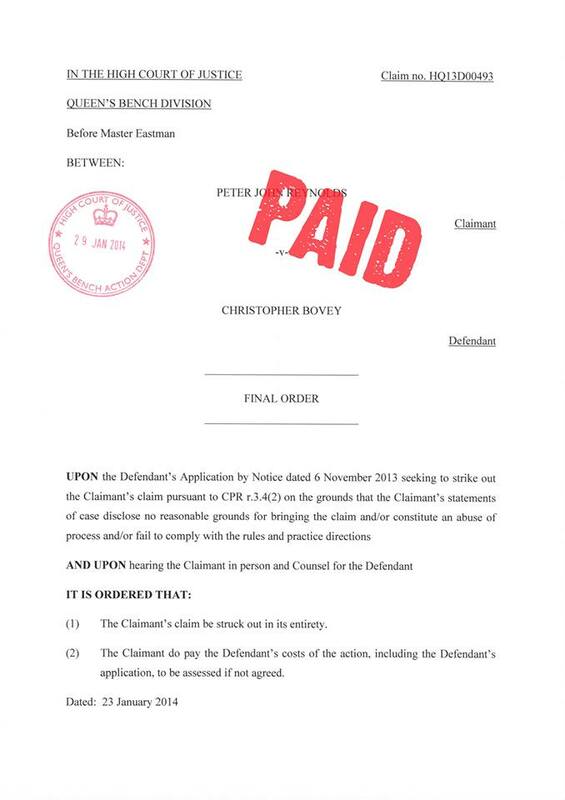 So Chris’ lawyers notified the solicitors holding some of the money that Chris had a legal right to claim what he was owed and they were prepared to make a legal application (with even more costs attached) to get it paid directly to him, and even then, Peter Reynolds still, initially, tried to refuse to pay it. But eventually, finally, even Peter Reynolds, god-man, could run no longer. Likely faced with few (if any) options, and presumably on advice from qualified legal professionals, he gave in, gave up, and handed over to Chris’ lawyer the sum of £36,323,86. The wheels of justice grind slowly, but they grind exceedingly fine. Chris with his costs order. ‘I always knew from day one I would win and I was prepared to fight the racist loony all the way. It did cause a me a huge amount of hassle, but at the end of the day I am not the one who ended up with a huge amount of egg on my face and despite him boasting that I stood ‘not a snowball’s chance in hell of getting a penny from him’, he’s now paid up almost double what he was originally ordered to pay. To quote Master Eastman’s judgment in 2014, Peter Reynolds failed to traverse the minefield in the defamation case he brought against me. He has also failed to evade paying me the Court ordered monies he had been ordered to pay me since that time. It has taken a very long time to ensure that Peter Reynolds paid his dues, but duly paid they have been. “Having acted for Chris since early 2013 in this matter, I am extremely pleased that he has now recovered much of the funds that he spent defending a suite of proceedings which were dismissed by the Court at each substantive juncture. In total, Peter Reynolds spent over £50,000 on taking us all to court – was it worth it? Did it benefit the cannabis consumer that he claims to so vigorously exert himself on behalf of? Did it benefit himself, down a substantial chunk of his inheritance and alleging to have PTSD as consequence of his bombastic, self-aggrandising campaign against all who questioned him and their highly unimpressed response? You be the judge. The judges, though, have made themselves pretty clear (ahem) on the matter. * There was a need for a technology to allow me to access some evidence stored digitally. However, this technology has now been invented and exists. * I had neither the time nor the inclination to wallow in the mind of Peter Reynolds any further when I had other far more interesting and pressing concerns. In the last three years, I finished my degree, was ordained as an interfaith minister, and spent a year abroad. I think it’s essential to recognise what is and is not important and writing a very niche book about my interactions with Peter Reynolds, while amusing, is not important, to anyone. However, my career has been relatively lucrative, and I am approaching the point that I have the money to pay someone else to do the research that needs doing to make it accessible to people who weren’t there at the time, leaving me to write the fun and interesting bits. 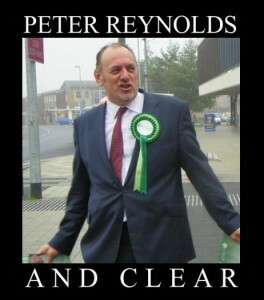 * Thirdly, the story of Peter Reynolds’ involvement in the cannabis community didn’t have an ending – he’s still there, still President (“irrevocable until death”, remember) of CLEAR, though he’s now trying to strong-arm people into joining a new outfit, the Cannabis Trades Association, in the belief that when legalisation comes to the UK, his magic touch will see him finally recognised for the fore-sighted genius he believes himself to be. However, the fact is that he has now lost a really quite mind-blowing amount of money (imagine what the cannabis movement could have done with £50,000). The fact is that he and CLEAR have been abandoned by even the fools like Derek and Roland willing to overlook appalling behaviour like reporting medical cannabis users to police to feel good about themselves. That and Peter Reynolds’s efforts to create and control a monopoly on CBD canna businesses by falling in with people who are sufficiently unhinged that they have actually been arrested for harassment, no small achievement in our experience – all this implies this story is slowly reaching its conclusion. Let’s not forget that that happened. Tell me about the book! Haha! The great greasy ego falls! It is always a joy to watch those who imagine they are mighty, being taken down. Although, you just have to listen to him talk for one minute to recognise a self-destructor! Hey Peter, hope you read this. Har Har de har Har! Not a fan o PR, despite supporting him in the first few month at Clear, until I realised what a plonker he was. 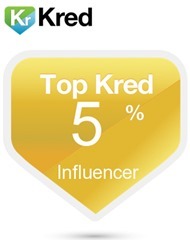 I recieved a linked in request from Clear a few months back, needless to say I ticked the ignore box. Personally I don’t want to read a book about him, it would only serve to ‘immortalise him’. What I want is for him to fade into the mists of time and be forgotten. This Reynolds guy is a real snake, I questioned him on the CLEAR Facebook page, he deleted my post banned me from the page and sent me a message saying he was going to hire lawyers to track me down and sue me. Good luck on that, I’ve moved to Switzerland. Glad he Chris finally got his money back.